…when you're on a healing journey (even healthy weight loss) that it's really important emotionally to have a treat. It helps you to endure the rest. 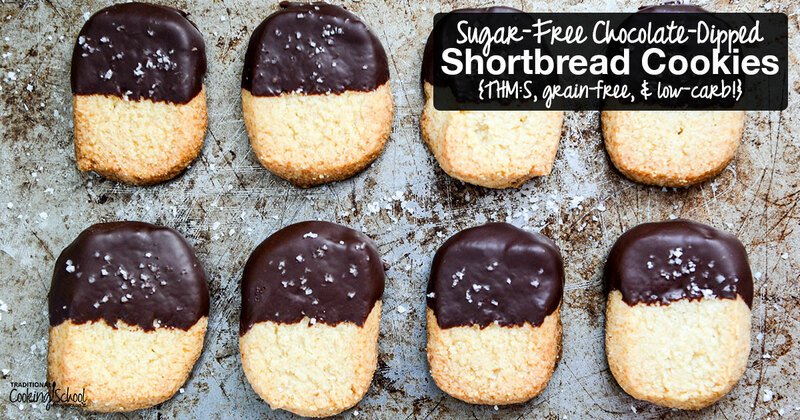 These Sugar-Free Chocolate-Dipped Shortbread Cookies fit the bill. 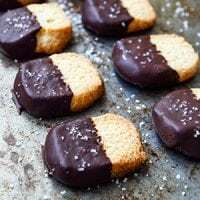 Yes, they're sweet cookies, yet you can enjoy them guilt-free because the recipe uses nourishing ingredients… and there's no sugar! That's right. It calls for erythritol (a sugar alcohol) and stevia — 2 sugar alternatives. They are not fake sugars like aspartame, by the way. This recipe comes from my friend Lindsey's brand-new eCookbook Sweet Without Sugar that's currently 40% off. She's graciously agreed to share the recipe here with you. Thank you, Lindsey! 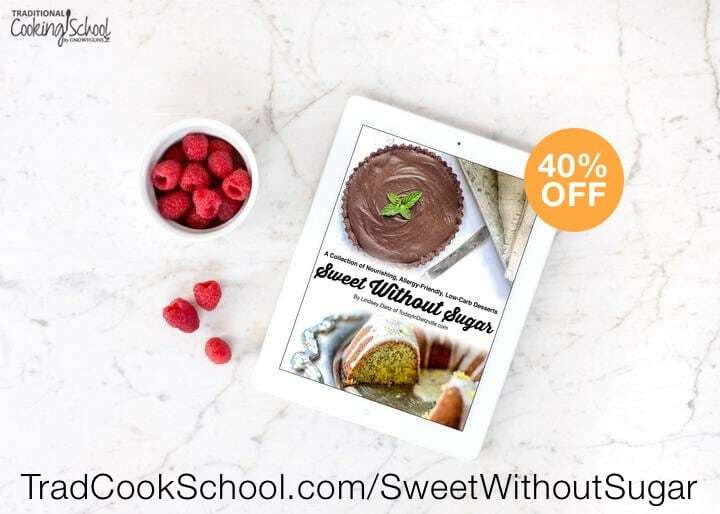 Click here for more info on the brand-new 40% OFF Sweet Without Sugar eCookbook. And now for the recipe! I made these the other day and the family announced they were keepers and we should make them again and again! Enjoy! Combine all ingredients, except fleur de sel, in the bowl of a stand mixer fitted with the paddle attachment. Turn out onto parchment paper and roll into a cylinder about 6 inches long. Wrap in the parchment and place the roll into the freezer for 15 to 20 minutes. Remove the dough from the freezer. Lay each slice on a parchment-lined cookie sheet 1 to 2 inches apart. Bake 15 to 20 minutes, or until golden brown on the edges and underside. Gently transfer the hot cookies to a cooling rack. Cool completely before dipping in chocolate. Melt 1/2 cup stevia-sweetened chocolate chips (such as Trim Healthy Mama brand) over a bain marie (water bath). Dip each shortbread halfway in the chocolate. Sprinkle a small pinch of fleur de sel over the chocolate. Allow the chocolate to harden completely in the fridge before peeling off parchment paper. 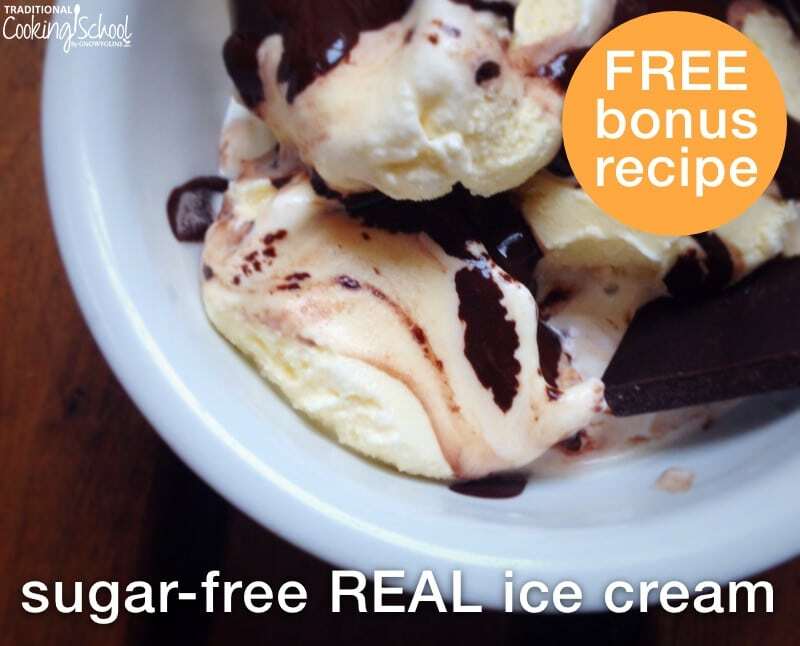 Want More Nourishing Recipes Using Erythritol? 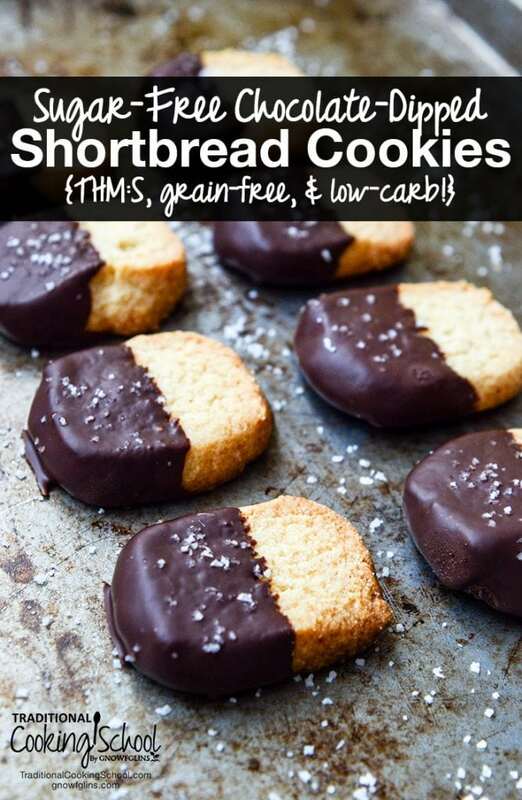 Yes, there are lots of low-carb recipes on the Web with xylitol or erythritol, but the other ingredients are not necessarily nourishing, whole foods, or allergy-friendly. The recipes are pretty scary, actually! What are your favorite nourishing, sugar-free desserts? Do you use sugar alcohols occasionally?